Judge clears driver in fatal crash - Patrick C. Fagan, Q.C. The accused walked away from court Monday free of legal encumbrances after being acquitted of drunk driving in connection with an accident that claimed the life of his passenger and close friend. There remains, however, an albatross around the 25-year-old man’s neck that may never be shed. “Every day . . . the worst is when I’m at work and when I’m driving down the road, especially where the accident happened,” the accused said when asked about the impact of the March 8, 2003, incident. Jesse Roberts, 23, died that night. 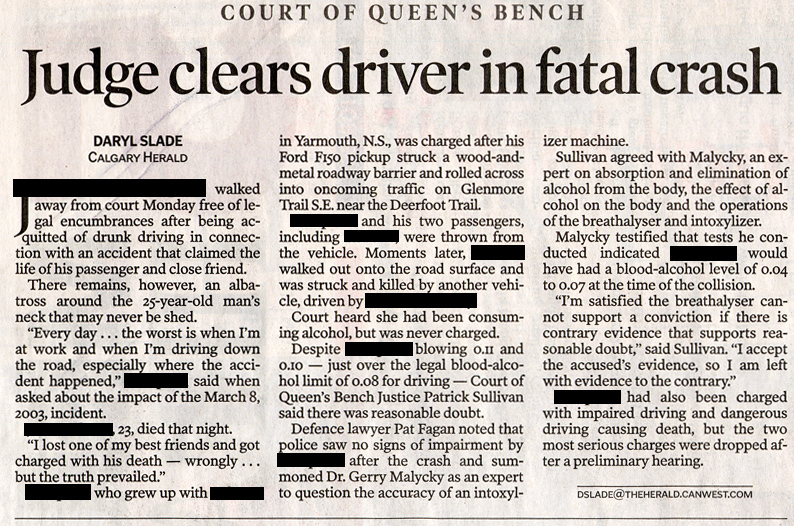 The accused, who grew up with Roberts in Yarmouth, N.S., was charged after his Ford F150 pickup struck a wood-and-metal roadway barrier and rolled across into oncoming traffic on Glenmore Trail S.E. near the Deerfoot Trail. The accused and his two passengers, including Roberts, were thrown from the vehicle. Moments later, Roberts walked out onto the road surface and was struck and killed by another vehicle, driven by Sharlotte Harvey. Court heard she had been consuming alcohol, but was never charged. Despite the accused blowing 0.11 and 0.10 — just over the legal blood-alcohol limit of 0.08 for driving — Court of Queen’s Bench Justice Patrick Sullivan said there was reasonable doubt. Defence lawyer Pat Fagan noted that police saw no signs of impairment by the accused after the crash and summoned Dr. Gerry Malycky as an expert to question the accuracy of an intoxylizer machine. Sullivan agreed with Malycky, an expert on absorption and elimination of alcohol from the body, the effect of alcohol on the body and the operations of the breathalyser and intoxylizer. Malycky testified that tests he conducted indicated the accused would have had a blood-alcohol level of 0.04 to 0.07 at the time of the collision. the accused had also been charged with impaired driving and dangerous driving causing death, but the two most serious charges were dropped after a preliminary hearing.